this time I deald with trying to get a game running in the browser on the N3DS, which was written with the GameMaker. The Nintendo New 3DS is Nintendo's current handheld, which is able to display on its upper screen 3-dimensional images without glasses and has a lower touchscreen. 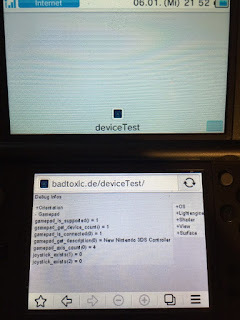 I'm going to share my findings with you here so that you can get games running on the N3DS, too. I want to find out at runtime whether the game is currently running on a N3DS, so that the game can adapt to this situation. I have written a small HTML5 application with GameMaker that displays some information about the device / program / browser, on / in which it is running. I've adjusted the resolution of this application to the 3DS touch screen size. The device has a resolution of 2 × 400 × 240 px, ie 400 × 240 px for each eye. 1. As OS iOS is detected! 2. There is exactly one gamepad identified with the description"New Nintendo 3DS Controller". 3:  // "(New) Nintendo 3DS Controller", like it's the case when the game was launched in the (New) Nintendo 3DS Browser. 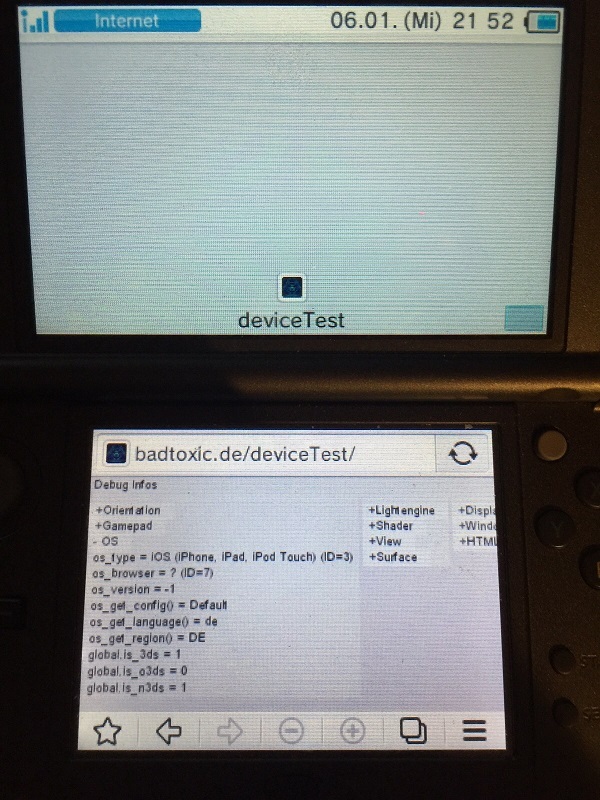 4:  // This script will also support detecting the old 3DS, even while its Browser doesn't support HTML5 (yet). 5:  // Returns true if it's any kind of Nintendo 3DS. It should be self-explanatory in this context for people being familiar with the GameMaker scripting language or general programming. On the screenshot you can see the result in the OS tab - it works. The gamepad is not available in the first step! It's best to use an alarm  = 2 event, or something like that, to this test a little bit later. And no - the async system event is not triggered, which can tell you about a gamepad just plugged in. 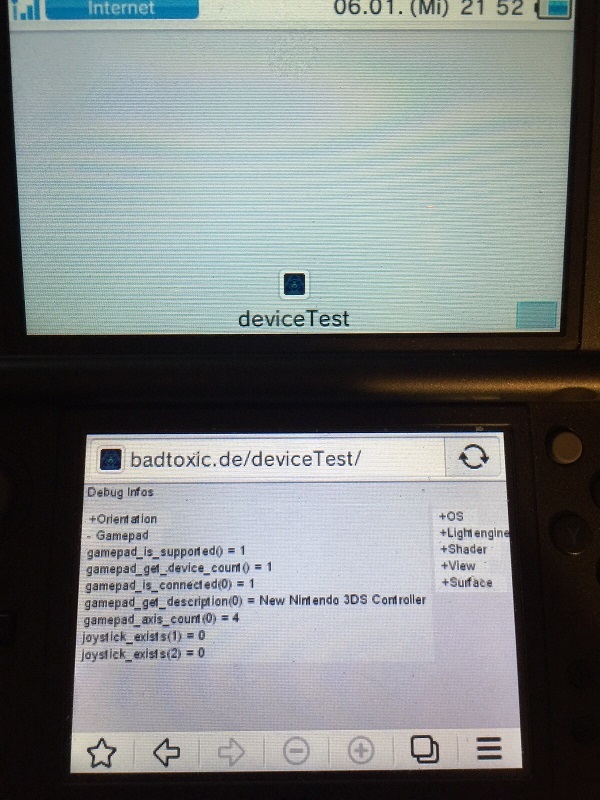 Then I also experimented with a game of mine on the N3DS, which I had already written for a browser. It seemed to me as would ten small scaled sprites slow down the game too much. So I would first start with only a few unscaled sprites or even geometric shapes only, then it might work well. In the mentioned game it didn't help to remove all unnecessary things like particles or graphics... The basic elements were already too complex. 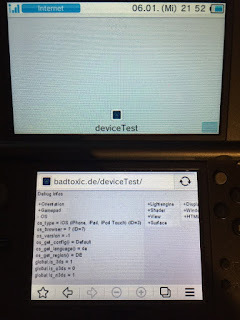 However, I think I will program something without GameMaker natively for the 3DS in C first - I already did a little Hello World program and I was able to run it on my device. ;) Maybe I'll tell you more about this here later. - Only the touch screen is usable. - You can also control with touch. But this unfortunately also brings up the lower browser bar - uncool! - By pressing "digital down" once you get a fullscreen. - The digital pad then is freely usable according to other gamepads. - The A button can be used in the game. All other buttons trigger a function in the browser. Do you now want to try it yourself?